With Invisalign braces from our experienced dentist, you can enjoy comfort, convenience, and confidence while straightening your teeth. These innovative braces are becoming a more popular choice with teens and adults alike because they cause the least amount of intrusion on the wearer's looks or mouth. Rely on us to provide you with these clear, invisible braces if you want to straighten your smile with less hassle than with traditional braces. Our dental office is an experienced Invisalign provider to many patients throughout the area. You will find clear braces easier to clean, more comfortable, and the satisfaction of being able to eat whatever you want. Speak with our friendly dentist today to learn more about why so many patients throughout the area are choosing Invisalign for their teeth straightening needs. The major reason that many teens and adults wear braces is so that no one can even tell they are wearing braces. Still, there are other reasons for you to consider choosing clear braces from our dental office besides appearance. As an Invisalign provider, our dentist is ready to discuss with you why these cutting-edge braces are such a popular option for those with crooked teeth or uneven teeth. 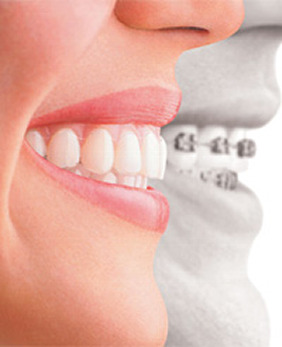 Our dentist has considerable expertise in providing this kind of braces. His knowledge and expertise enables him to deliver successful results you expect and deserve. Our clear braces are special because they work differently from traditional metal braces. Invisalign uses clear aligners to change the overall shape of the patient's smile. Each set of aligners is worn for a short period of time, usually no more than two weeks. Additionally, these aligners are removable for eating, drinking, and brushing teeth to help you keep your teeth healthy and clean. Finally, after two weeks have passed, the patient returns to our office to receive a new set of aligners. In this way, the shape of the smile is gradually changed with far less discomfort or hassle than with traditional metal braces. Start smiling with confidence by discussing your Invisalign options at our dental office. While no braces can offer an instant fix to problems with bites that often take decades to fully manifest, invisible braces from Invisalign actually work much quicker than traditional metal braces. These state-of-the-art braces work efficiently and usually require an average treatment time of just twelve months, which is far less than the years of traditional metal braces can take. That's why our dental office wholeheartedly recommends Invisalign to all of our patients looking to improve their smile. If you have resisted braces because of how they look or how long they take to work, it might be time to change your mind due to these technological advances. We especially recommend our clear braces to older patients who might be self-conscious about wearing traditional metal braces. Contact our Invisalign provider when you want a straight smile without using traditional metal braces. Our team meets with patients from Raleigh, Wake Forest, Louisburg, Youngsville, Franklinton, North Carolina, as well as the surrounding areas.